Nearly everyone has looked at what seems like a minor electrician or plumbing job and assured themselves that this is a no-problem, DIY opportunity. We understand that it can sometimes seem like the cheaper and easier decision to just head on over to Home Depot and take your chances. But the man vs. machine narrative can only be entertaining until you’re at the end of the wikihow instructions you found and no closer to getting your electricity back in-line. There’s actually quite a few instances before this point where you can tell that it’s just going to be easier to call in an electric service and repair, rather than try your hand at playing with electricity. If you’re experiencing the problems below, it’s probably best just to give your San Rafael electrician a call. If you’re busy digging into your newest DIY project and you come across some cloth covered wires or scraps of black rubber while you’re busy removing switch covers and outlets, tap out. That is what we politely call “old-fashioned” electrics and impolitely call “jerry-rigged.” We recommend backing away and phoning Divine Nocal Electric rather than potentially playing with literal fire. If you’re finding yourself thrown into the dark because your electrical circuit breaker is throwing a fit, we don’t recommend trying out your beginner’s hand at it. 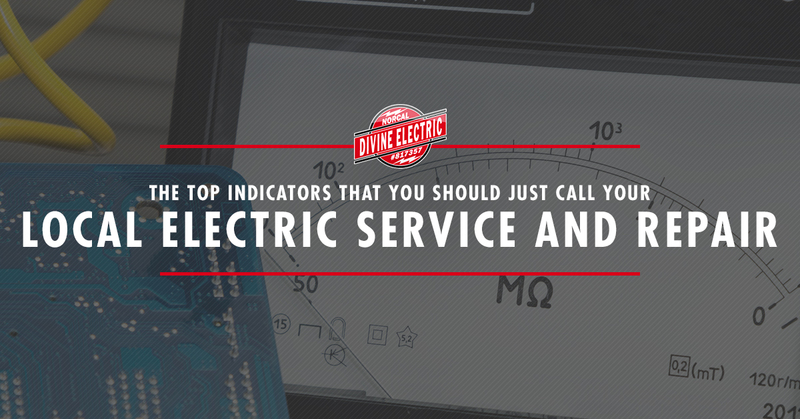 If the breaker is tripping more often than it should or your fuses are blowing more frequently than they should, it’s best to call a professional local electrician. When these things occur more often than expected it points to the possibility that your circuits might be drawing more electrical current than they should be, for whatever reason. Usually, it implies there’s a fault in at least one of the circuits within your home. If you’re seeing your lights wane and flicker like the light bulb is going out, but you’ve replaced it nearly three times now, it’s not the light bulb. If you see them flickering or waning, even if they’re dimming when you turn on a couple of different lighting fixtures. This might be a sign of incorrect basic wiring. For example, your motor-driven appliances may not have their own dedicated wires and circuits or your small appliances may be leeching some of the energy as well. In this scenario, just give us a call rather than trying to rewire your home by yourself. By old, we mean over 25 years old. If it hasn’t been modernized for at most 25 years, then there’s a solid chance that your electrics are antiquated. Rather than trying to fix wires and apply quick DIY fixes to electrics that don’t even follow the same rules as the ones that wikihow site is explaining is rather dangerous. An electrician will be able to assess whether or not your home has electrical flaws or has any age-related damage that needs to be fixed. Since the electrical industry’s safety standards change fairly regularly, there might be a good amount of work to be done to get the home back up to parr. We’d be happy to ensure that your home is safe to work on and that it’s up to code. Give us a call now, so that when something else minor happens with your electrical wiring, you’ll feel comfortable and be safe when you start your DIY project to fix it. Reach out to us for all of your electric service and repair needs. We pride ourselves on being available to help the citizens of San Rafael with any of their electrical issues, day or night.